Mount Merapi is a volcano in the middle of Java Island and is one of the most active volcanoes in Indonesia. Forest areas around the peak of Mount Merapi National Park area since 2004. This mountain is very dangerous because according to modern records eruption (peak liveliness) every two to five years and is surrounded by a very dense settlement. Since 1548, this mountain has erupted as much as 68 times. Because of this level of importance, Merapi is one of the sixteen volcanoes of the world included in the Decade Volcanoes project. Mount Merapi appears in the southern part of the alignment of the ranks of volcanoes in Central Java from north to south ie Ungaran-Telomoyo-Merbabu-Merapi with the direction N165 E. This straightness is a fracture associated with cracking due to tectonic activity that preceded volcanism in Central Java . 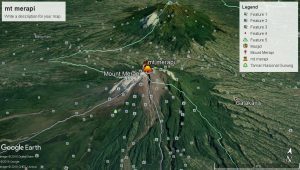 This volcanic activity shifts from north to south, where mt. Merapi appears the youngest. In the period 3000 – 250 years ago recorded approximately 33 times the eruption, of which 7 of them are large eruptions. From these data indicate that large eruptions occur once in 150-500 years (Andreastuti et al, 2000). The eruption in 1006 made the whole of the island of Java covered with ash, based on observations of volcanic ash deposits. Dutch geologist van Bemmelen theorized that the eruption caused the center of Medang Kingdom (Mataram Kuno) to move to East Java. In the new Merapi period there have been several major eruptions, namely the 19th century (1768, 1822, 1849, 1872) and the 20th century, 1930-1931. The 19th century eruption was much larger than the eruption of the 20th century, where the hot clouds reached 20 km from the summit. The likelihood of a major eruption occurred once in 100 years (Newhall, 2000). Merapi activity in the 20th century occurred at least 28 times the eruption, where the largest eruption occurred in 1931. Already ¾ century did not happen big eruption. The eruption in 1872 was considered the strongest eruption in modern geological records with a VEI scale of 3 to 4. The November 1994 eruption caused the hot clouds down to reach several villages and killed 60 people. The July 19, 1998 eruption was quite large but pointed upwards so it did not take any casualties. Note the last eruption of this mountain is in 2001-2003 in the form of high activity that goes on and on. In 2006 Merapi volcano back to high activity and had swallowed two lives volunteers in the area of ​​Kaliadem due to exposure to hot clouds. Geologists in 2006 detected a giant space under Merapi containing materials such as mud that “significantly inhibited earthquake vibration waves”. Scientists estimate the material is magma. This magma sac is part of the formation formed by plunging the Indo-Australian Plate under the Eurasian Plate. The latest eruption, 2010, is also estimated to have near or equal forces. The 1930 eruption, which destroyed thirteen villages and killed 1400 people, was the eruption with the largest victims record to date. Mount Merapi is a volcano cone with composition of andesitic basaltic magma with silica content (SiO2) ranging from 52 – 56%. Its top morphology is characterized by a horseshoe-shaped crater, in which the lava domes grow. The eruption of Mount Merapi is characterized by the discharge of magma onto the surface forming a lava dome in the center of the active crater around the peak. The emergence of new lava is usually accompanied by the destruction of old lava that closes the flow resulting in lava. New lava that reaches the surface membetuk dome that can grow bigger. The growth of the lava dome is proportional to the rate of magma flow that varies to hundreds of thousands of cubic meters per day. The lava dome that grows in the crater and enlarges causes instability. The unstable lava dome is positioned and driven by the pressure of the gas from inside causing some landslides resulting in a hot cloud. Awanpanas will flow gravitatively along the river valley at a speed of 60-100 km / h and will stop when its motion is exhausted. This is a hot cloud called Type Merapi which poses a major threat. In historical records, the eruption of Mount Merapi is generally not large. When measured by the VEI (Volcano Explosivity Index) eruption index between 1-3. The sliding distance of awanpanas ranges from 4-15 km. In the 20th century, the largest eruption occurred in 1930 with the eruption index of VEI 3. Although Merapi eruptions are generally small, but based on stratigraphic evidence in the field found hot cloud deposits are thought to have come from a large eruption of Merapi. Given the thickness and variation of the spread, it is estimated that the eruption index of VEI 4 with the eruption type between volcanic and plinian. This great eruption is estimated to occur during the Merapi Muda, about 3000 years ago. Since the year 1768 has been recorded more than 80 times the eruption. Among these eruptions, a large eruption (VEI ≥ 3) is a period of the 19th century (eruptions of 1768, 1822, 1849, 1872) and the period of the 20th century ie 1930-1931. The 19th century eruption of the intensity of the loom is relatively greater, while the eruption of the 20th century is more frequent. The likelihood of a major eruption occurred once in 100 years (Newhall, 2000). Large eruptions can be explosive and the reach of awanpanas reaches 15 km. Mount Merapi eruption since 1872-1931 leads to the west-northwest. But since the big eruption of 1930-1931, the direction of the eruption was dominant to the southwest until the eruption of 2001. Except in the eruption of 1994, there was penyeimpangan to the south that is upstream K. Boyong, located between the hills Turgo and Plawangan. The last eruption in 2006, a change of direction from the southwest to the southeast, by forming a crater opening that leads to the river Gendol.